Originally written on January 14, 2004! The image I treasure in ‘Doctor Zhivago‘ is Julie Christie‘s face. She looks about as perfect as a human being is capable of looking on film. Blonde hair, piercing blue eyes, silky red lips, flawless skin. [Hmmm, sounds like an ad in a fashion magazine.] Only Grace Kelly in ‘Rear Window’ has ever come close to looking as radiant and stunning as Christie did in director David Lean’s 1965 epic. Perhaps it’s her beauty and the lush appearance of the film as a whole that captured my imagination when I first saw it on home video years ago. After seeing the crisp DVD release of ‘Doctor Zhivago’, it’s even more apparent that the gorgeous look of this picture earns it such high marks in my proverbial movie highlight book. [Such a book doesn’t exist, but maybe it should.] While not as clear and dynamic as modern DVD releases, this movie is a vivid series of paintings that make up the moving picture. If you’re not impressed with the story, turn the sound down and watch the artistry. Once you get past what your eyes see, however, your ears may not be as impressed. Boris Pasternak’s novel (adapted by Robert Bolt, who also wrote ‘Lawrence Of Arabia‘ and ‘Ryan’s Daughter’ for Lean) has a series of good scenes, but the characters are often superficial and a little dull. When two people in this story (pick ‘em, any two) aren’t having affairs or tying to kill one another or finding ways to flip-flop political allegiances, they’re pining like teens at the prom. But then again, other romantic epics such as ‘Gone With The Wind’ and ‘Titanic’ have had those same “my love means more than the rest of the world” flaws, and I forgive ‘Doctor Zhivago’ for its trite diversions because it’s so well produced. Typical of a David Lean production, the picture is as meticulous as any movie made in its era. No surprise there because Lean is probably best known as a visionary “big picture” filmmaker, the heir apparent to D.W. Griffith. He may have started his career with smaller films (‘Brief Encounter‘ for one), but this man was the best at creating what Spielberg called a combination of “pageantry and intimacy”. This picture brought Julie Christie into the spotlight. She won an Academy Award for ‘Darling’ (also a 1965 film), but this is the performance that viewers remember. Sharif, if not already suitably famous following the success of ‘Lawrence Of Arabia’, became a legendary Egyptian actor who could convincingly play Arabs, Russians, whatever. His dashing good looks were adaptable. Rod Steiger (Victor Komarovsky, Lara’s benefactor) was already well known, but perhaps his sinister work here helped to garner him an Oscar for ‘In The Heat Of The Night’ two years later. Steiger also starred in ‘The Pawnbroker’ that same year, earning an Oscar nomination. His sheer range was rare and he was at his zenith as an actor in this period. Tom Courtenay was the only actor to receive an Academy nomination for ‘Doctor Zhivago’, playing the revolutionary Strelnikov. Geraldine Chaplin (Charlie’s daughter) made her first major film appearance, plaing Zhivago’s wife, Tonya. Alec Guinness and Ralph Richardson round out the fine cast, bringing their English credibility to important supporting roles. Even with all those names in the credit roll, this isn’t really the actor’s showcase that it could be. It’s more about mood and style, sizzle over steak. While most agree this movie doesn’t measure up to Lean’s previous epics, it’s an ironic point to make. Producers and audiences usually seem to prefer a balanced male/female cast. Failing that, they want at least ONE woman in a starring role. But even though ‘Bridge’ and ‘Lawrence’ have glaring absences of any major female roles, they were superior achievements. In some ways, they are more intimate and powerful too. ‘Doctor Zhivago’ is manipulative, over-long, and occasionally banal. In its way, however, the film is more traditionally appealing than its predecessors. Where ‘Lawrence’ has no female speaking parts at all, ‘Zhivago’ is entirely about the beauty and love of a few women for a doctor/poet. Lean was a dedicated filmmaker from 1957-1965, shooting on location in a Sri Lankan jungle, then in the enormous Sahara Desert, followed by the vast expanses of Spain and Finland (substituting for the Russian wilderness). Why did he go to such lengths? Authenticity? Maybe to avoid studio interference? After all, the suits would have a hard time interfering when the company is in the middle of nowhere. In any event, Lean became a master of the outdoor epic with this trio of films. Prior to this period, he’d directed intimate English films (‘Brief Encounter’, ‘Great Expectations’, and ‘Oliver Twist’ in the mid-40s). He worked with Freddie Young on ‘Lawrence’ and ‘Zhivago’, and it’s clear thay made as fine a team as any director & cinematographer ever have. Shots are composed with such detail in ‘Zhivago’, it nearly could have been a black-and-white picture. In fact, some scenes feature characters wearing black clothes and walking past dark buildings surrounded by white snow, highlighting how easily and effectively this could have been a colour-free movie. But had they gone that route, we’d be deprived of Julie Christie in all her lush vibrancy. 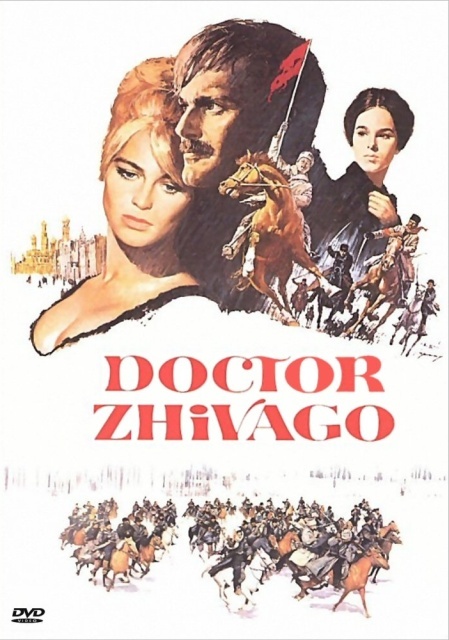 ‘Doctor Zhivago’ won 5 Academy Awards and received 10 nominations. Winning for its script, cinematography, sets, costumes, and music, the film missed out on winning Best Picture and Best Director awards. Those honours went to Robert Wise’s epic of a singing nun on the run, ‘The Sound Of Music’. ‘Zhivago’ was also honoured by the American Film Institute by placing #39 on their “100 Years, 100 Movies” list and #7 on their “100 Years, 100 Passions” list. Interesting then that the movie was not treated well by critics upon release. So harsh were some of the notices that Lean almost quit making movies for good. The public liked it, but he was too deeply affected by the criticism to enjoy the film’s success. It would be 5 years before he’d make ‘Ryan’s Daughter’, which wasn’t popular with many critics either. As a DVD, this is a nice little purchase. Just don’t waste 200 minutes listening to the commentary track. Sharif, Sandra Lean (the late director’s wife), and Steiger are fond of this film and they certainly tell some interesting stories. However, there’s too much dead air in the commentary, particularly at the beginning of Side B. The conversation between Sharif and Lean meanders, with Sharif coming across as a prima donna while recollecting that he nearly had a nervous breakdown when he wasn’t getting feedback from his director or raves from anyone for his acting. Too bad they didn’t get Julie Christie to share some of her thoughts because this movie could have indeed been called ‘Lara’. Take a peek at the vintage interviews on the disc too, where she appears distracted and not the least bit interested in talking to the press. Incidentally, she’s still acting at 62 years old, with appearances in high-profile 2004 titles ‘Troy’ and the 3rd ‘Harry Potter’ movie. ‘Doctor Zhivago’ is a flawed film that doesn’t achieve brilliance, but it’s still pretty great all the same. Freddie Young’s photography enhances the film so much and that is just about enough to inspire reverence, despite the shortcomings. Julie Christie can thank her cameraman for making her look like an angel. If Yuri Zhivago’s obsession with his forbidden lover is romantic AND immoral, it’s also understandable when you see the close-up Christie gets near the end of the film. He’s just returned from the Siberian wilderness and has passed out in Lara’s apartment. He wakes up…and there she is, as beautiful and sensual as anything he has ever seen. I’m thinking, maybe I’d ditch the Russian revolution and my loving family for this woman too. Or I’ll at least be happy to own the DVD and stare glassy-eyed at the most beautiful images of a film actress ever created.